Automist® is an innovative, fire protection solution designed to allow open plan layouts to comply with regulations, it can create a safe escape route in an existing open plan house with no impact on rent-able space. Automist Technology is proven to be fast acting and effective as a Fire suppression system by keeping temperatures low delaying flashovers. Testing has shown that Automist® can extinguish small fires and greatly impedes the development of very serious fires. Most importantly, it gives occupants the incentive to escape the room of origin instead of attempting to fight the fire. Meanwhile, Automist® suppresses the fire, avoiding a flash-over and buying valuable time for the fire fighters to extinguish the fire with minimized effort and risk. Automist® uses a high-pressure pump to generate a fine water mist from nozzles mounted on a wall at light switch height. 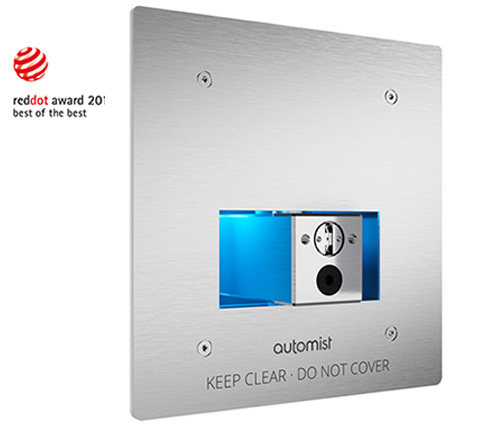 A standard volume filling Automist installation is a discreet wall mounted spray head. It can be installed seamlessly and unobtrusively for single room fire protection of residential premises. 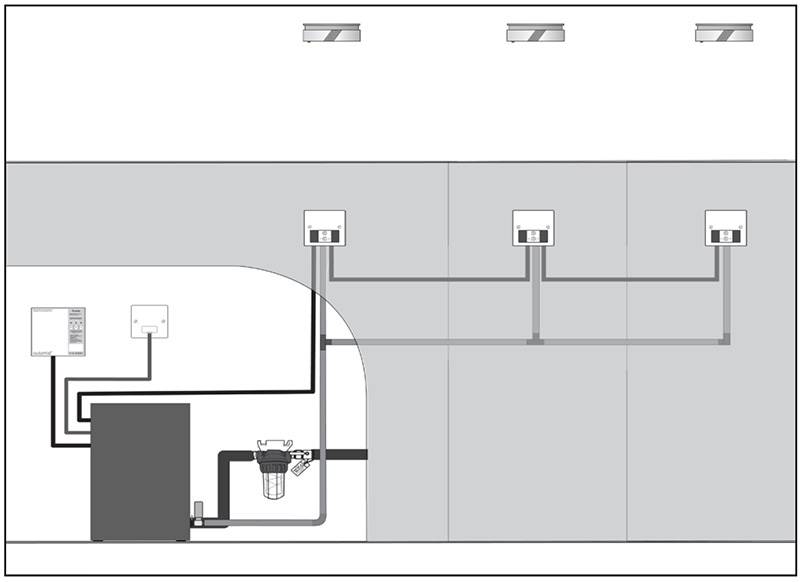 Installation requirements – Reliable water supply (6 lpm flow and 1 -10 bar pressure) connected with a standard BSP ¾” fitting. 230V 50Hz electrical supply on an independent circuit. Automist won the James Dyson Award in 2009 and was selected by the British Library as one of the top 15 inventions of the last decade in 2010. Automist® Smartscan Hydra is a smarter, modern fire sprinkler system. 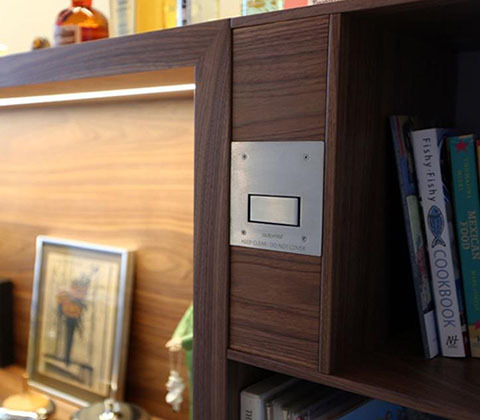 Instead of the typical ceiling-mounted sprinkler head, this device consists only of a stainless steel panel that seamlessly integrates into the interior of any living space. Welcome to the 21st Century Sprinkler. The selected spray head will lock onto the selected location, and activate the high-pressure pump, driving mains water through the unique nozzle unit, quickly directing a dense fog into the location of the fire. The high momentum vertical spray orientation with a horizontal trajectory is designed so even shielded fires are saturated with a turbulent flow of mist, suppressing the fire. All the other heads lock closed. In this way, it is like a traditional sprinkler system designed to supply water to only one head so all the water is supplied over the fire. However, one huge advantage it boasts is that this approach uses 90% less water. The result is significantly less water damage to the living space. From the point of view of the approving authorities, the Automist technology is proven to be fast acting and effective, either extinguishing or delaying the growth of the fire long enough to allow people to escape and the fire and rescue services to attend. It keeps temperatures low, too, delaying flashovers. Its use is of course supported in Approved Document B and BS 9991:2015, the new code of practice for fire safety in residential buildings. In acknowledgement that Smartscan Hydra falls outside of the prescriptive scope of traditional product standards, Plumis took the unusual step of pushing them to the limit in further third-party testing. In short, the Automist products are a safe bet for their intended use.